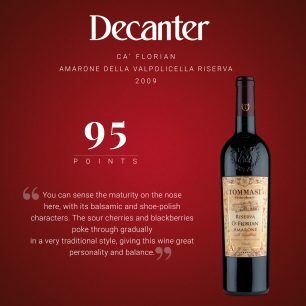 We are delighted to announce that the Tommasi Ca’ Florian Amarone della Valpolicella Riserva 2009 was the highest scoring wine, with 95 points, in a recent Decanter Panel Tasting by Andrea Briccarello, Michael Garner and Susan Hulme MW. The Ca’ Florian was one of only two ‘Outstanding’ wines in this Panel Tasting which critiqued over 160 wines! The Ca’ Florian vineyard lies on the limestone soils of the hill separating the valleys of Marano and Negrar at the heart of the classico area. From the terraced vineyard planted to the ancient pergola system to the use of the ancient arele (slanted bamboo racks) for the appassimento process, the long, slow fermentation and the four-year ageing period in wood (mainly in old Slavonian oak botte), giving this wine great personality and balance. Contact Effi to find out more about this “Outstanding” wine.